This page has been re-organized for easier navigation. It is arranged now through a series of hyperlinks to individual fragment events. This should save you from having to scan the entire page which was getting lengthy. QRSW impact information is at the bottom of this page. Some spectra and explanation have now been added at the bottom as well as an mpeg movie showing the evolution of the fragment R "fireball"
On a larger scale, all of this is brought to you by the National Science Foundation. The NSFnet backbone supports Internet connectivity to this site and hopefully the delivery of real data in quasi-real time demonstrates the power of the Internet today. 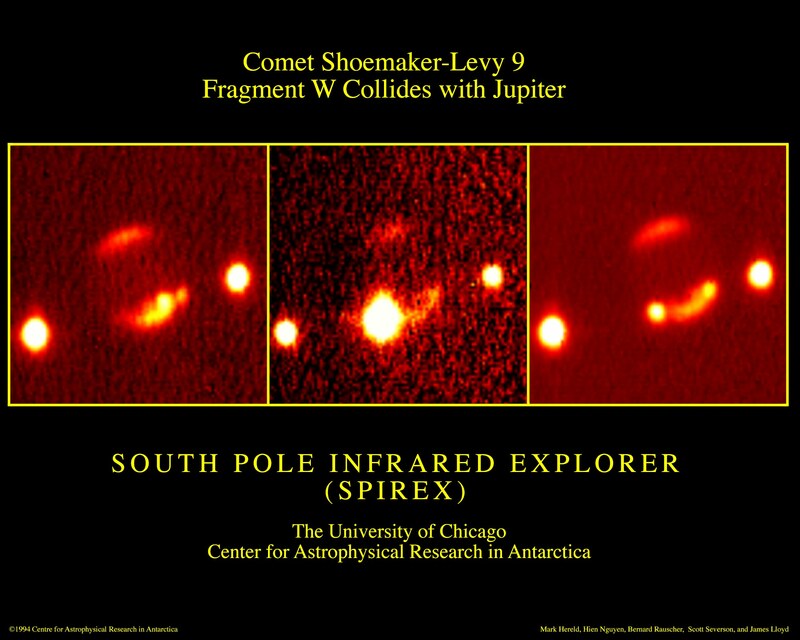 At the Pine Mountain Observatory we will be monitoring Jupiter in both linearly and circularly polarized light in order to possible detect and changes/disruptions of Jupiter's magnetic field due to these exploding balls of hot plasma. Those results will be presented here later. As expected, nothing detected at optical wavelengths. Sorry. This is a nice image, again in the Infrared, which shows many previous impact sites. The bright object in the northern hemisphere is one of Jupiter's moons. Notice that the R event still has lots of structure associated with the impact site but the two sites to the right have now decreased in size a bit and much of the extended structure is gone. This is a very interesting comparison. It clearly shows how tidal forces have elongated the individual nuclei and have decreased their overall size as the fragments approach Jupiter. The obvious fact that the nuclei can survive to be 1--2 km size junks at impact will provide important diagnostic information on the material strength and composition of comet nuclei. Since the composition of Jupiter is almost identical to that of the Sun there is a fair bit of helium (about 8% or so by number of atoms) in the atmosphere of Jupiter. The emission seen in this spectrum is at 584 Angstroms and comes from neutral, not ionized helium. The transient brightening at 584A maybe due to reflected solar 584 emission from the high-altitude remains of the plumes, which presumably dragged up a lot of He from below (normally the solar 584 line is reflected from so high up in the atmosphere that the He abundance is much less than its value of 11% in the lower, well-mixed atmosphere). This spectrum shows the increase in methane emission as a direct result of the impact of fragment R. The increase is about a factor of 10. The excitation mechanism is unclear but is probably related to general heat transfer from the impact site to a larger area. As this hot bubble of gas expands in cools, it is less efficient at exciting molecules such as methane, which radiate strongly at short infrared wavelengths. The duration of this methane flare was about 20 minutes. Similar flares at longer wavelengths associated with ethane and acetylene lasted for 2 hours. In this mpeg movie, which is a collection of individual 2.3 micron images, one can see the developing "fireball" as the fragement R impact evolves. The jitter in the frames is due to atmospheric effects as are the apparent changes around maximum brightness of the fireball. The movie is quite long, coming in at 1.2 megs. What if you lived on Jupiter?